"Sampath Speaking" - the thoughts of an Insurer from Thiruvallikkeni: son of pacer who ran in fast and hurled deliveries !!! son of pacer who ran in fast and hurled deliveries !!! Nothing big ~ he has played in 5 T20s – scored 38 runs with 21 as highest – watched him play a T10 today !!! Carrara Stadium (known commercially as Metricon Stadium) is a sporting venue on the Gold Coast in Queensland, Australia, located in the suburb of Carrara. The venue is primarily used for Australian rules football and is the home ground of the Gold Coast Suns, who compete in the Australian Football League. The stadium has hosted the opening and closing ceremonies of the 2018 Commonwealth Games as well as the athletics competitions. Gold Coast is a coastal city in the Australian state of Queensland, approximately 66 kilometres (41 mi) south-southeast of the state capital Brisbane and immediately north of the border with New South Wales. It was the venue of T20 match between touring South Africans and Australia. The Gold Coast region remained largely uninhabited by Europeans until 1823 when explorer John Oxley landed at Mermaid Beach. The area boomed in the 1980s as a leading tourist destination and in 1994, the City of Gold Coast local government area was expanded to encompass the majority of the Gold Coast's metropolitan area, becoming the second most populous local government area in Australia after the City of Brisbane. Today, the Gold Coast is a major tourist destination with its sunny subtropical climate and has become widely known for its surfing beaches, high-rise dominated skyline, theme parks, nightlife, and rainforest hinterland. It was not the greatest of matches – in a rain-reduced 10 overs aside, the innings changed with du Plessis' dismissal. With 3.1 overs left South Africa had a score of 120 on offer. Du Plessis hammered Stanlake to deep midwicket. Very few fielders in the world could have saved six let alone completed the catch. Maxwell leapt high and took the catch at full stretch above his head while momentum carried him over the rope. He threw the ball up just before his left foot hit the ground over the rope, he balanced, got back inside the rope and made the end result look exceptionally simple despite the incredible degree of difficulty. Coulter-Nile and Andrew Tye then closed the innings brilliantly conceding just 24 runs from the last 18 balls and claiming three wickets with some well-executed slower balls. Finch is the Captain, and the team reads : Chris Lynn, DJM Short, Glenn Maxwell, MP Stoinis, BR McDermott, AT Carey (WK), Nathan Coulter-Nile, AJ Tye, JP Behrendorff, B Stanlake ~ not exactly an inexperienced line-up or perhaps we are able to familiarize the team because of IPL .. ..
Metricon Stadium on the Gold Coast had set itself for its first international cricket match, just seven months after hosting the 2018 Commonwealth Games. But a deluge of rain pre-game, 18 millimetres in total, nearly ensured the match never started. Fortunately, the heavy rain cell passed due to strong winds. The game did start after a delay of nearly two hours, with the playing conditions changing to 10 overs per side, two overs maximum for each bowler, with a three over Powerplay. South Africa inflicted Australia's third loss in four matches to leave the home side down right miserable. Australia have now lost their last four T20Is and five of the last six on top of losing a one-day and Test series in between times. The squad did ring a bell – McDermott is a known name – it is Benjamin Reginald McDermott who has not followed the family trend of bowling fast like his father Craig and brother Alister, but has instead made a name for himself as a batsman and some-time wicketkeeper. Craig McDermott made his Test debut aged 19 on the way to 291 wickets and his son Alister had a Queensland rookie contract before leaving high school in Southport. Alister, who was in year 12 when the deal was signed, carries the red hair and bowling action of his father and Queensland are hoping for similar results in the future. Benjamin Mcdermott is playing as a batsman .. ..
Craig Mcdermott (photo at the start) bowled fast, and threw in accurately and flat. He played 71 tests taking 291 wickets at an average of 28.63 and in 138 ODIs he took 203 wickets. Remember that he played in that famous Tied test at Chepauk but went wicketless. He played in 2 matches at Chepauk further – Reliance WC 1987 – against India in the first match he took 4/56 and against Zimbabwe 1/13. 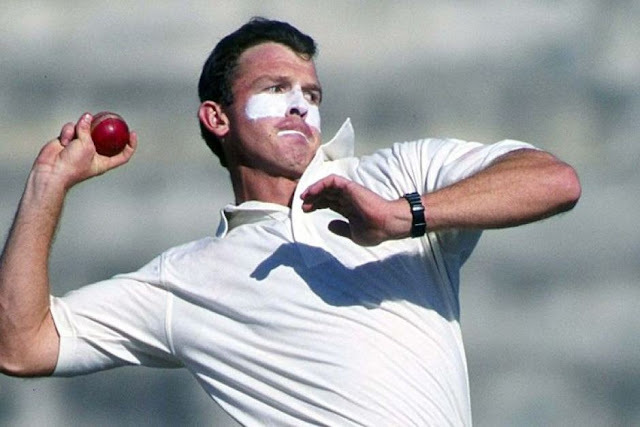 Craig McDermott used to smear his face white with chapstick, run in fast and hurl down quick deliveries — several years before Allan Donald had transformed the act into the realms of legend. His career was plagued by injuries .. ..